As I noted in my previous post, I’ve been traveling to Arizona recently and sampling Bloodies in the Southwest. Of course, I did my homework in advance of my trips and one Bloody Mary that I specifically sought out was the Verde Mary at The Windsor in Phoenix. Tucked into its namesake historic Phoenix neighborhood, Windsor is a neighborhood bar and restaurant with a backyard-style patio,high-quality wine and beer on tap, a robust selection of prohibition cocktails and a menu that features casual bar food with an upscale twist. 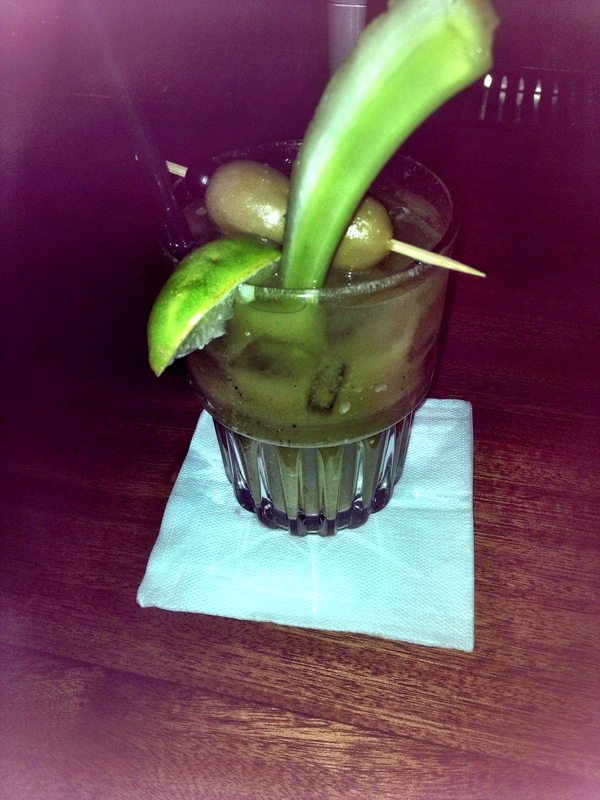 I was tipped off to the Verde Mary at the Windsor from an article in Arizona Foothills Magazine. The Windsor offers a traditional Bloody Mary, which features red tomatoes, roasted vegetables, Fresno chilies and fresh horseradish, in addition to the Verde. Of course, I wanted to try the Verde. I’ve never had a GREEN Bloody Mary before. Mix: The Verde uses green tomatoes, cucumbers, roasted poblanos, cilantro and watercress–all incredibly fresh. I visited The Windsor on a Saturday evening. Initially, I was told that they only serve this drink on Sundays, but since it was Saturday evening, I guess they were already prepping for the morning rush (or the bartender saw the look of disappointment in my eyes) and I was served this delectable delight. This Bloody Mary was very different, but tasted amazing. I highly recommend you check it out, your taste buds will thank you. The food at The Windsor was also very good. My research indicates that the restaurant hosts a fully loaded Bloody Mary bar available Saturday and Sunday from 9 a.m. to 1 p.m. Garnishes include cocktail onions, caper berries, pickled green tomatoes, jalapeno-stuffed olives, olives, citrus, celery salt, old bay seasoning, pimento peppers and more. On my way out, I noticed a line stemming out the door of a nearby establishment. Since it was almost 10 p.m., my curiosity got the better of me and I went to check it out. Imagine my delight when I stumbled upon Churn, a quaint but AMAZING ice cream shop, so named for its freshly CHURNed ice cream. With a line out the door, I knew it had to be good, so I did the only thing I could–I got in line. After much deliberation, I settled on the peanut butter ice cream on a pretzel cone. Yep, pretzel cone. Totally worth the $1 upgrade. I know you’re reading this for the Bloody Mary review, but let me tell you…. 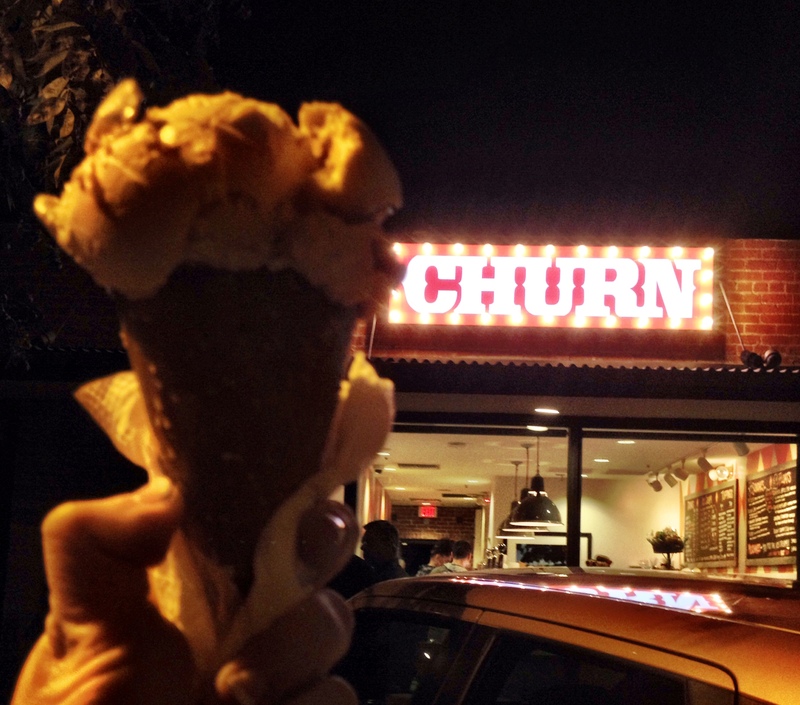 if I never eat ice cream again, I will die satisfied after my visit to Churn. Hands down best cone I’ve ever consumed (and full disclosure, I returned a week later to get another!). Highly recommend you check out the Verde at the Windsor, but be sure you leave room for dessert next door.